Madeline Gannon, PhD-CD ’17, MSCD ’11 debuted the robot installation Manus, commissioned by the World Economic Forum, at the organization’s 2018 Annual Meeting of New Champions in Tianjin, China this past September. 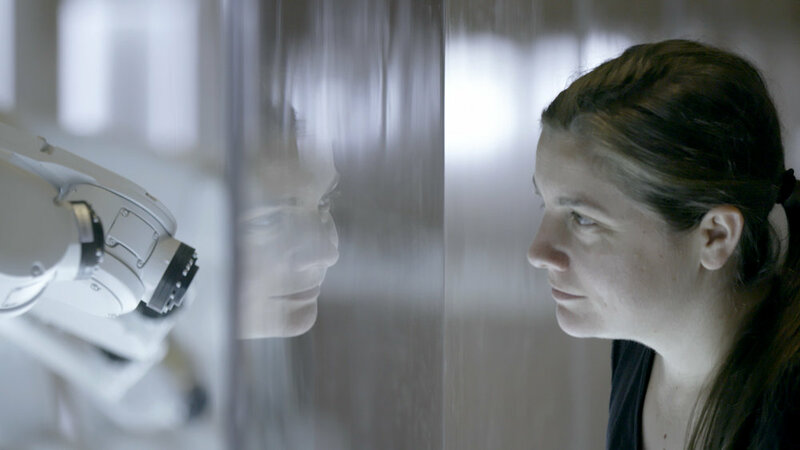 The installation explores the potential for humans and machines to live harmoniously. "The robots in Manus don't look like and they don't act like us – but they can still connect with us in meaningful ways," said Gannon. Gannon also wrote on the topic of human-robot coexistence in a column for Dezeen. Madeline Gannon is a multidisciplinary designer working at the intersection of art and technology. She leads Atonaton (formerly MADLAB), a research studio inventing better ways to communicate with machines. Her work blends disciplinary knowledge from design, robotics and human-computer interaction to innovate at the edges of digital creativity. Gannon holds both a PhD and a Masters of Science in Computational Design from the School of Architecture at Carnegie Mellon University. Her PhD dissertation focused on developing techniques for digitally designing and fabricating wearables on and around the body.